Its time to start prepping for festival season. Returning to Ontario, Canada for its fifth annual installment, Ever After Music Festival has just announced its solid 3-day artist lineup for the forthcoming June. 7-9, 2019 weekend. Feast your eyes on the full day by day lineup and 2018 after movie with us. 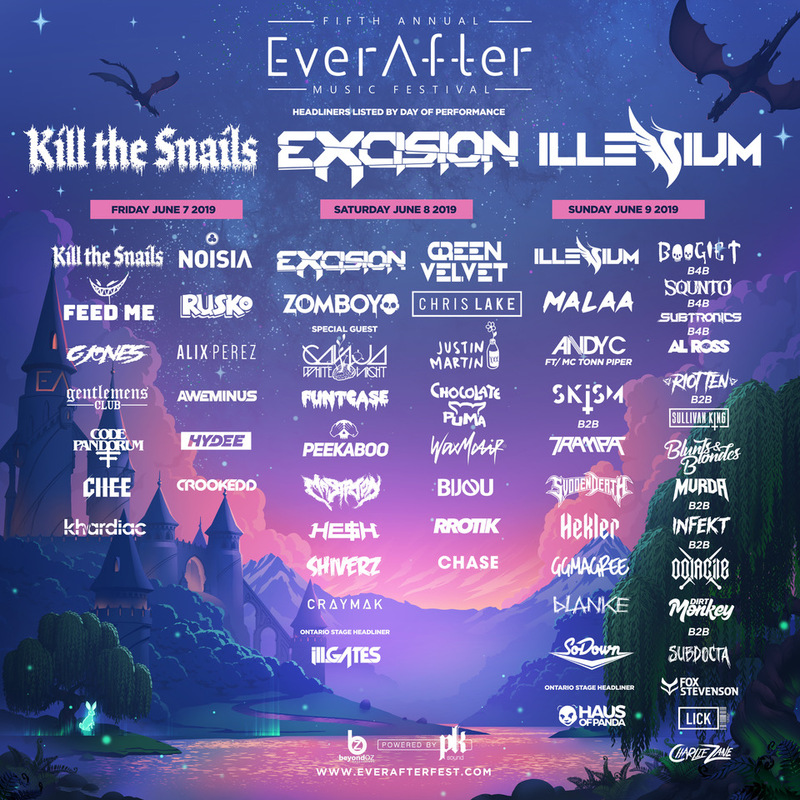 Ever After Music Festival delivers some of the hottest dance acts in the game today The bass heavy festival roster welcomes headliners such as Excision, Illenium and collaborative team up of Kill The Snails. Also included: Andy C, Chocolate Puma, Chris Lake, Feed Me, G Jones, Ganja White Night, Green Velvet, Justin Martin, MALAA, Mastadon, NOISIA, Rusko, Svdden Death, Wax Motif, and Zomboy are some of the top notch support on the bill. Ever After will present exclusive B2B performances from Boogie T B4B Squnto B4B Subtronics B4b Al Ross, Dirt Monkey B2B SubDocta, as well as the Canadian debuts from SKiSM B2B Trampa and Mastadon. After four successful years and hosting nearly 100,000 attendees over the course of the weekend , Ever After Music Festival plans on an even bigger fifth edition. Enhanced sound system, upgraded stage production and new VIP amenities are just the tip of the enhancement iceberg at Ever After. Fans and festival goers should be heading into summer with high expectations and even more passion to party.